I have tried meditation numerous times. I just cant' seem to make it part of my regular routine. However, I have learned to do it 8 second intervals, and it has been life changing. I stumbled across something that really resonated with me as I was reading (yet) another book or article on meditation. Each breath is an opportunity to start over. The context of the statement was don't worry about wandering thoughts when you meditate. Just observe them without attachment, let them go, and refocus on your breath. Even if you have to do this a million times during your meditation session, remember each breath is an opportunity to start over. Wait, what?? Each breath is an opportunity to start over? So, if I mess up, screw up or things have just gone wrong and not according to plan, if I am still capable of drawing in a breath, then I have an opportunity to start again? Think about how powerful that is for a minute. You aren't stuck with that mistake or circumstance forever. It doesn't define you or hold you hostage because that next breath is a new opportunity to begin again, to move forward. 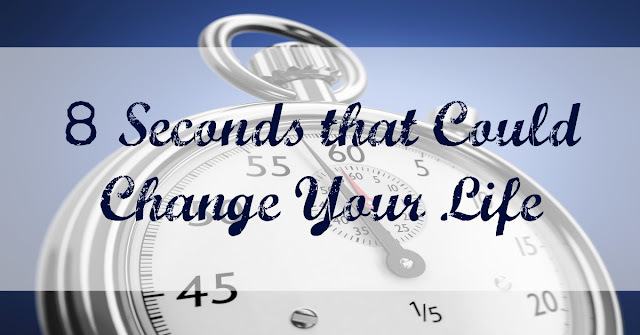 One big breath in takes 4 seconds and letting that breath out slowly takes another 4. That 8 seconds separates your dark past from your bright and shiny new future. So, let's say, hypothetically speaking of course, I eat an entire batch of cherry chocolate chip cookies instead of just the one I promised myself I would stick to, I take a deep breath, throw the empty bag away, and start over. What if the screw up was a long time ago, like a rift between an old friend, or family member? Words were exchanged that you now regret, but so much time has passed. If you can draw a breath, then you have an opportunity to start over. It's not too late. That breath is life. If you have life you have an opportunity to move forward and begin again no matter how many new beginnings it takes. The breathing and the beginning again are equally important. If you are just breathing and not moving forward, then you are basically in a coma. Don't voluntarily live in a coma. Beginning again is a form of moving forward. Here's the thing though. You can't truly move forward if you are holding onto the past. Learn from it, take one big breath in, then let "IT" go . "It" being the breath and whatever real or perceived transgression you committed. If you don't let "IT" go, "IT" will keep pulling you back. That's why you throw away the empty cookie bag or apologize for snapping. Then you figure out what led you down that road, and begin again armed with your new information to make your new beginning more successful be it the 2nd try or the 1,332nd try. So remember this today. When you mess up, or things don't go as planned, ask yourself, "Can I till breath?" (Hint: if you were able to ask the question then the answer is yes). One big breath in, let it go. Now begin again.